What Are the Top 10 Company Pages Doing Right on LinkedIn? Recently, LinkedIn users have been driving lots of engagement on the platform, growing their network, and even generating leads. It’s amazing that with a solid content strategy, nearly anyone can grow their influence. However, today I’m less focused on individuals, and more interested in what companies are doing well on the platform. Recently I stumbled across a LinkedIn blog post on the top ten company pages of 2017. I was curious what these companies were doing right on the platform. How did they manage to stand out among 13 million other LinkedIn company pages? That’s a rather vague basis for scoring the top ten pages, so I figured an analysis would be helpful for anyone out there running a LinkedIn company page. To give some context, LinkedIn began accepting nominations on July 17. 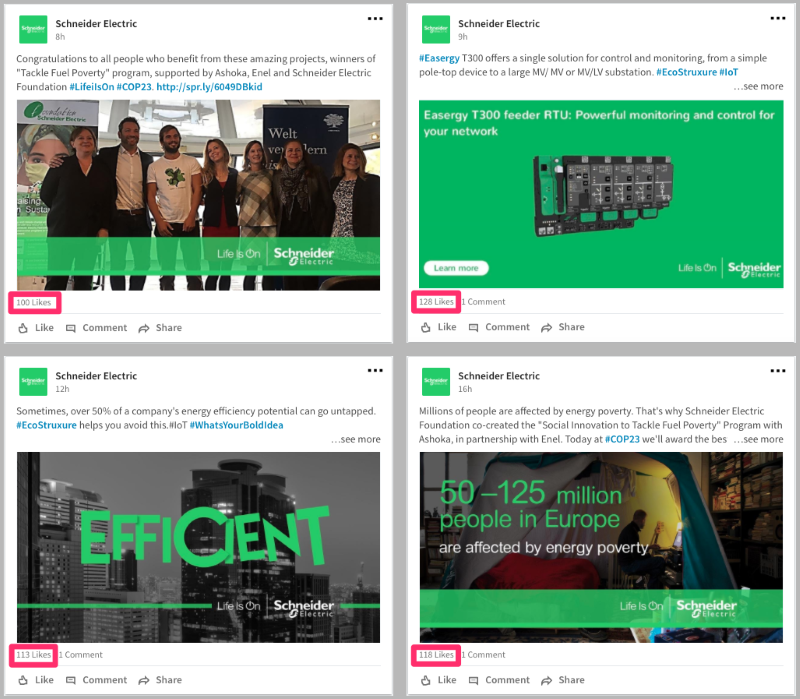 People could vote on the winners by tweeting to LinkedIn Marketing Solutions or commenting on the original LinkedIn update. Certainly an interesting group of companies, not necessarily what I expected. Now it’s time to look at some of the reasons why these company pages deserve such a prestigious award. Let’s take a look at what they did well. For the most part, each of these company pages posts at least a couple times a week. However, there is a bit of variation. 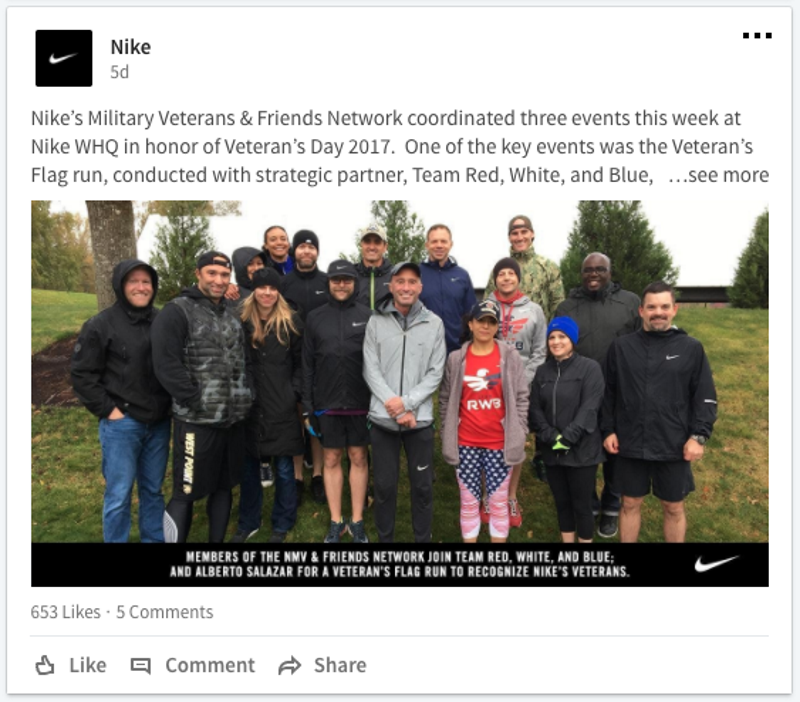 For example, a majority of the company pages seem to stick with a posting schedule of several times a week, such as HP and Nike. However, other pages such as Hays and Schneider post several times a day. Regardless of how much you choose to post, stay consistent with it. There doesn’t appear to be a correlation in terms of the amount of posting that takes place and the rate of engagement. Hays has a lot of posts with a small amount of engagement yet continues to post many times a day. On the other hand Schneider, which posts a similar amount, boasts a lot higher engagement. 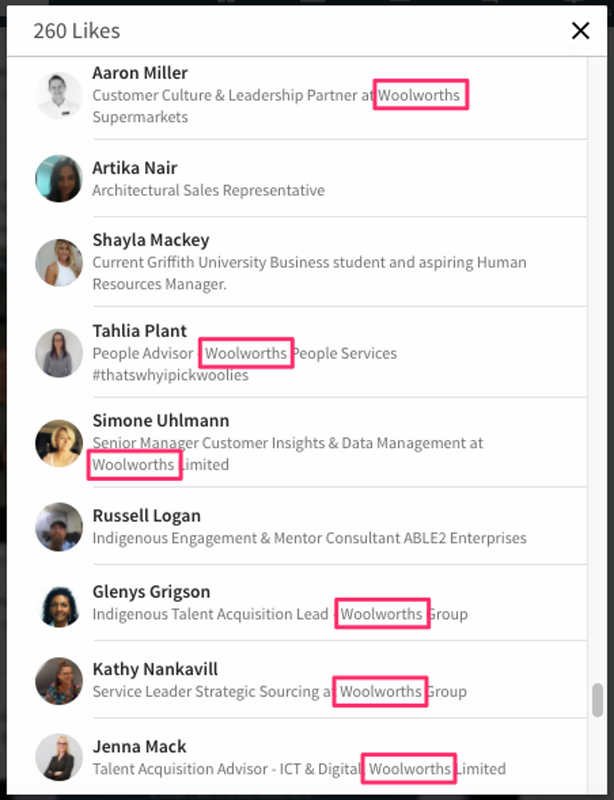 Furthermore, Woolworths posts only once or twice a week, yet drives even more engagement with fewer followers. What this means is that it isn’t necessarily how much you choose to post, but rather if it’s consistent and high quality content. The top ten LinkedIn company pages have a good deal of variation in regards to the content they’re sharing. As important as it is to have a defined content strategy on LinkedIn, based specifically on your company’s industry and offering, the types of content we see generally fall into four categories. Community, company news, employee-features, and informational content. Community: Everyone knows that companies are in it to make a profit. They have to hire and fire people, hit certain figures, put other companies out of business, etc. Perhaps this is why it’s so refreshing when companies focus on the greater good. It certainly strengthens their brand and creates trust in the eyes of a consumer. Company News/Employee Features: These two themes go hand in hand. They focus on the highlights of the company both as a whole and from an individual level. This helps to show off the accomplishments of the company and express its vision. Furthermore, it helps to highlight the individual achievements of employees as a way to congratulate them on their hard work. Both go a long way in establishing good morale within the organization. Informational Content: This type of content includes company blog posts, white papers, eBooks, etc. It’s the typical type of website content shared via social media, and it’s often done so in an effort to educate prospective customers. There is no problem with sharing this form of content, but it can appear a bit promotional when all you share are links to your own articles over and over again. However, when it is weaved into the content variation we’ve outlined here, it can be quite effective. It truly depends on the quality of the content and its alignment with the audience. If you’re sharing great content but it fails to resonate with the audience, it’s going to perform poorly. Most of the companies on the top ten list brand nearly every piece of content they push out, since nearly every update has an image or rich snippet. This is evidenced above in the posts shared by Schneider with lime green elements included in every picture. Branding may not be quite as important as the content itself, but it does help in terms of recognition and reputation development. It’s a very small, but easy part of content sharing on LinkedIn, especially with tools like Visme that allow you to create branded templates with company colors, logos, etc. 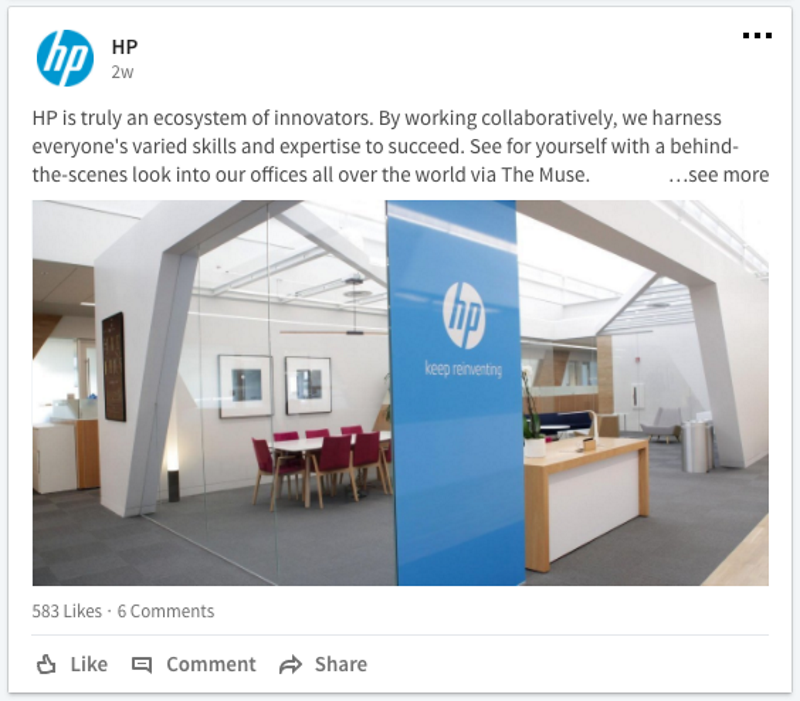 In HP’s LinkedIn feed, you’ll see the classic light blue color in nearly every post, either as part of the picture, a logo in the corner, or simply as part of the graphic design. It’s interesting to see how each of these ten companies excel in their respective niche on LinkedIn. 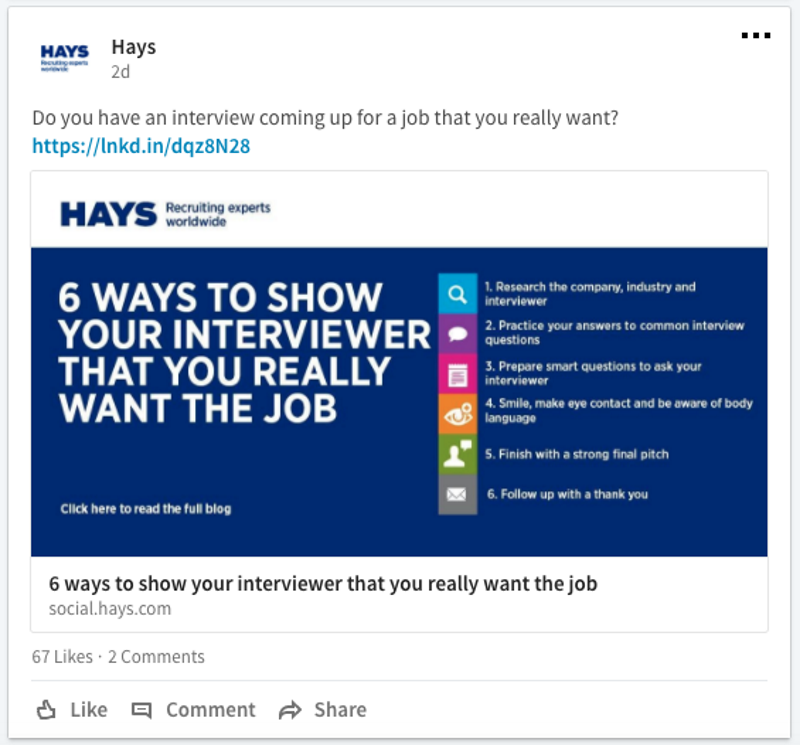 For example, Hays shares post after post about recruiting and job searching. This may seem overly promotional since they’re sharing their own articles time and again (which I noted as something to avoid). Nonetheless, they manage to get away with it because of their industry (staffing and recruiting) and the platform they’re delivering the content on. People on LinkedIn are focused on work. They’re in “work-mode”, receptive to information regarding employment, career growth, etc. On the other hand, we see a company such as Woolworths. As a supermarket chain, they won’t be successful by trying to give you tips on picking out bread or milk at your next trip to the store. Rather, they use the platform as a way to appreciate their employees and show off company achievements. Just look at the people who are liking Woolworths content. All Woolworth employees! The point I’m trying to make is that any company can be successful on LinkedIn as long as they understand their audience and their role on the platform. Are they trying to generate leads? Increase brand awareness? Increase company/employee morale? Where does your company fit in? Now it’s time to think about your company, brand, customers, and offering. How does it all fit into the opportunity that LinkedIn presents? You can adhere to some of the general rules I’ve outlined above. In fact, I would very much encourage you to be aware of how consistently you post, the branding you include, and the actual type of content you share. To truly take advantage, you need to dig a little deeper in order to apply these strategies to your particular company page. The best place to begin is simply to examine other company pages of businesses very similar to your own. These companies (your competitors most likely) have a backlog of data that you can take advantage of. Look through their past posts and take note of what content performed best. Also take note of branding, content type, who they appear to be speaking to, etc. Extract and use what’s performing well in a style that represents your brand. This will be the easiest way to get started. Author Henry FosterPosted on December 12, 2017 Leave a comment on What Are the Top 10 Company Pages Doing Right on LinkedIn?